Our Glass Pitcher Sets can be Custom Printed with Your Restaurants Logo or Message. All-in-One, These Glass Pitcher Sets are Available as a 4 Piece Mug Set or a 4 Piece Pint Set. The Pint Set includes 4 16 oz Pint Glasses and one 60 oz Glass Pitcher. The Mug Set includes 4 12.5 oz Mugs with a 60oz Pitcher. The Minimum Order is Just 72 Glass Sets. 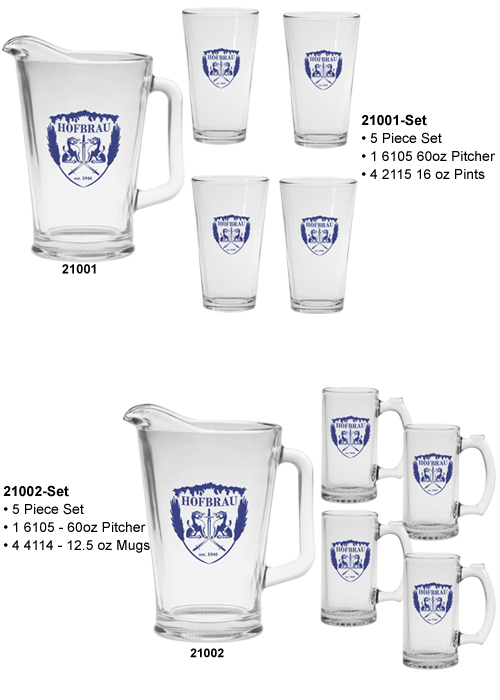 Pricing for Custom Pint/Pitcher Sets – Call 1-800-233-0828 for more info or to order! It's easy to have your own Glass Pitcher Sets. Simply call 1-800-233-0828, and submit your camera-ready artwork to graphics@kardwell.com (you may also mail your art). The minimum order is just 18 Pitcher Sets. You will receive your Glassware in about 3 to 4 weeks. Rush delivery is available.